Just like the Inflatable boy with a pin, some plants have let themselves down badly this year! Every year there are the star performers and then there are those which have disappointed beyond belief. The alchemy of each summer's heady brew of temperature, moisture and sunshine produces different over- achievers every year and, sadly, under achievers too. I don't want to dwell on the under- achievers, but you know who you are ... hang your heads in shame all those of you in the Amaranthus family, and all of you in the Celosia family too. You have failed to thrive and grow despite being lavished with care and attention. Although you showed early promise, it has never been realised, and if I want to find you in the garden, I need a magnifying glass. Most of you, however, are no longer with us, having been devoured by any number of bugs, and, to be honest, you deserved your fate. You've let yourselves and the the garden down. Hang your head in shame, too, Pennesetum 'Purple Majesty' ( maize) which looked so great in the seed catalogue, you zinnias with your microscopic flowers and the pathetic Thompson & Morgan Cosmos 'Xanthos'. I always thought Cosmos couldn't go wrong, as it has been so reliable over the years, but I have been proved wrong. This year I have one plant left from all my healthy seedlings in April, and it has grown into a sickly, stunted plant with nondescript, no - colour flowers the size of a button. But enough of the failures! 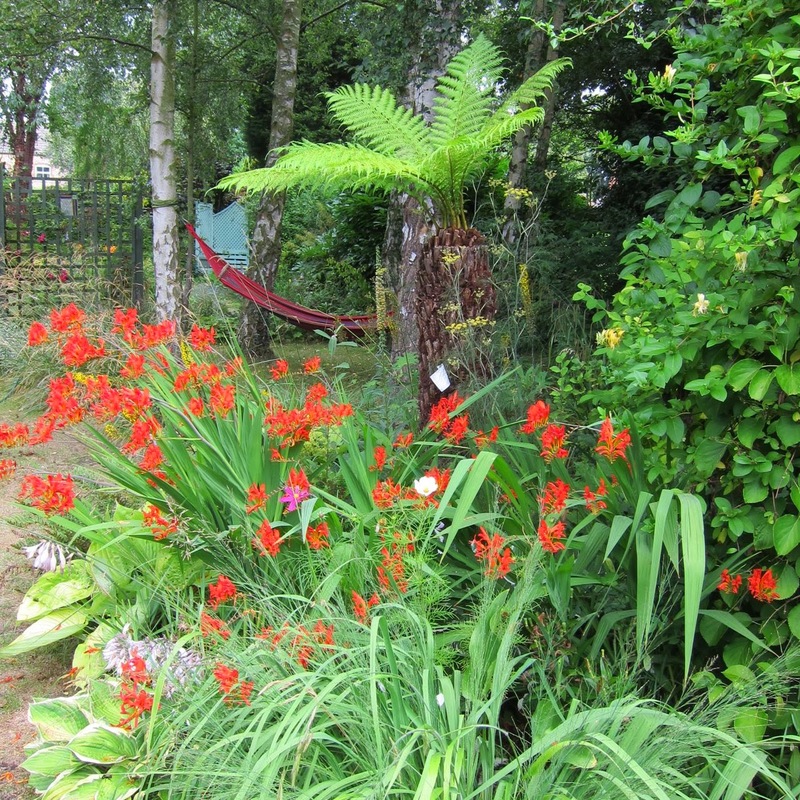 I want to celebrate those plants which are putting on a death - defying extravaganza of colour, despite what the weather has thrown at them this summer. 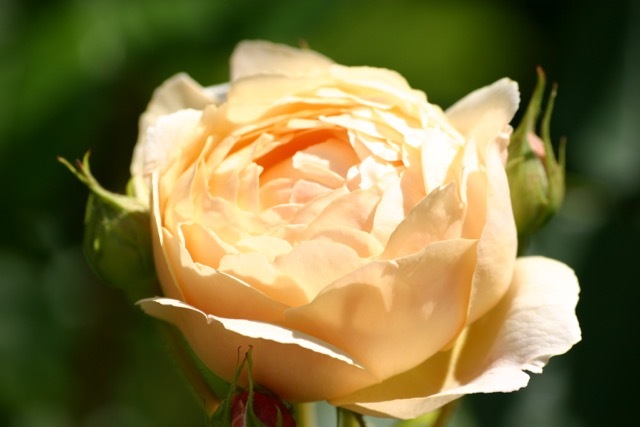 The roses got off to a late start after a cold spring, and just as they were getting into their stride, along came frequent heavy downpours, causing many blooms to ball and rot. 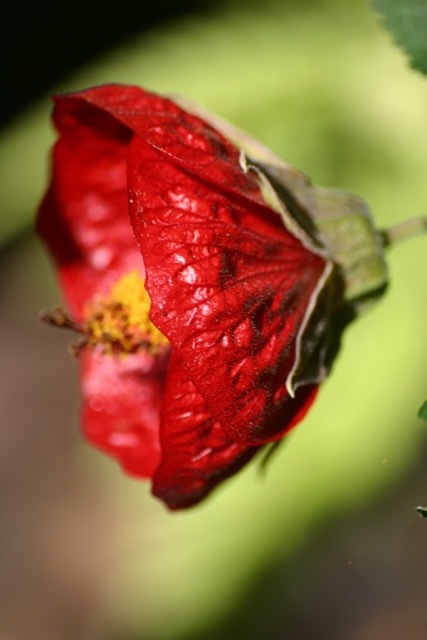 Whilst some could be saved by gently peeling off the dried outer petals, many could not. However, they have overcome all, and are finally in gorgeous, billowy bloom. 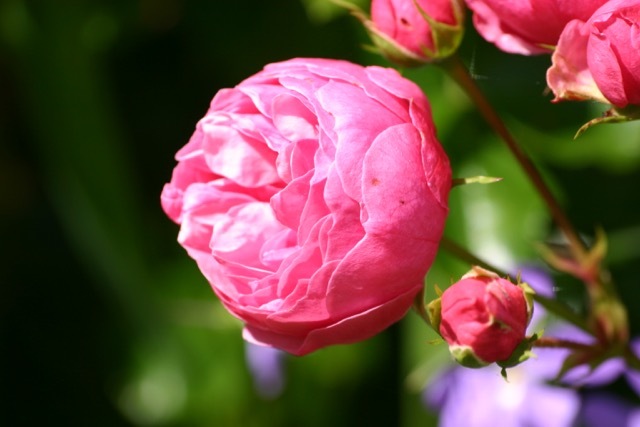 My current favourite is a new rose to me, 'Pomponella', with unusual, almost spherical flowers, of a strong pink. 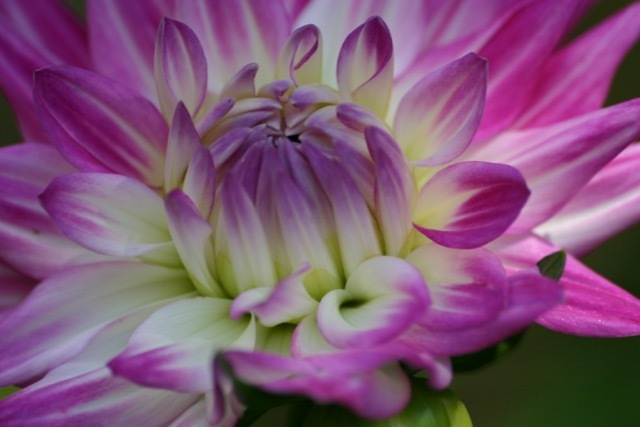 As it is a repeat flowerer, I hope there will be a succession throughout the summer. It looks very healthy so far, and is showing resistance to blackspot and insect infestation. 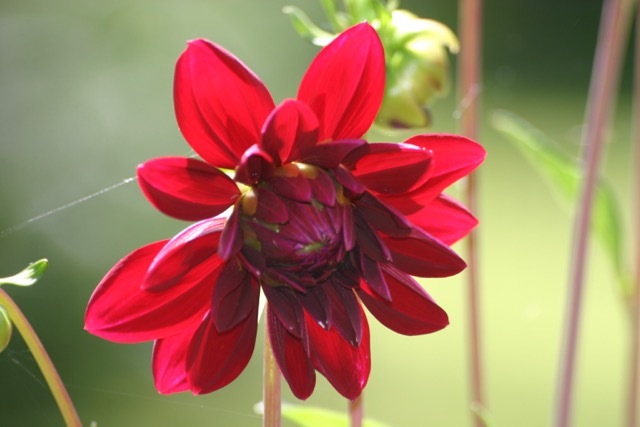 Always reliable are the dahlias, and I am growing both old favourites and new varieties this year. 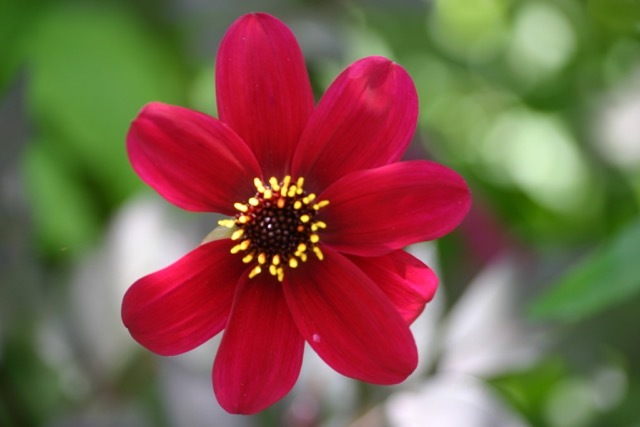 I grew 'Victoriana', 'Redskin' and also some Cactus dahlias from seed, but have not seen them flower yet, so they may join the Invisible boy, in his class, if they fail to live up to expectations. I do tend to prefer the dark, rich colours, so the one pictured below is a bit of a disappointment, as it looks very washed out, particularly when the sun is on it. This new bi-colour certainly smacks you in the face, and brings colour to the new sub-tropical area, as does the un - named dark red one too. 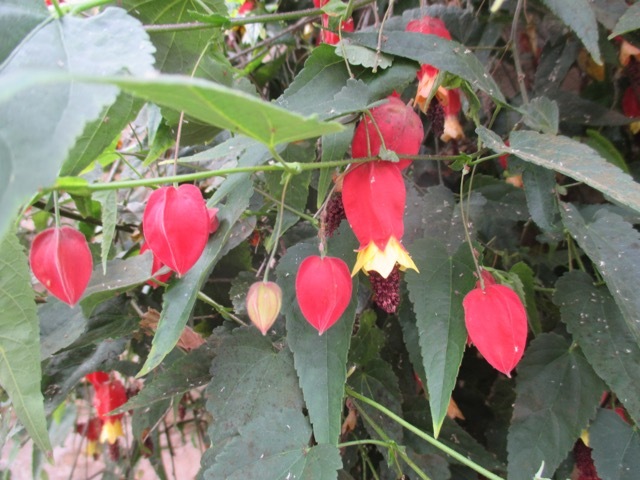 When I went to Chelsea earlier in the year, I bought some Abutilon plug plants, and also found out more about these lovely shrubs. 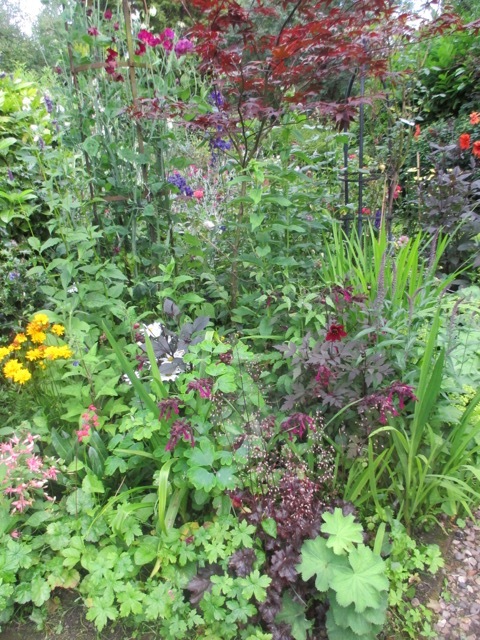 In the intervening weeks they have put a lot of growth on, and have started to flower. 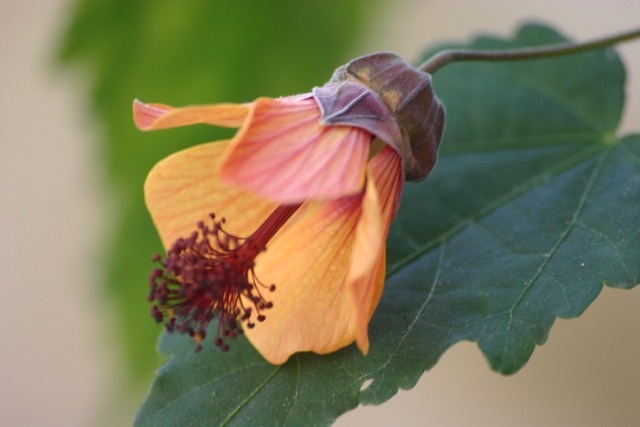 The photo below shows Abutilon 'Mayan Magi', which is a lovely soft apricot colour, shot through with red veins. I am hoping to take cuttings a little later in the season, as I would like to try growing some in a sheltered position outside, but don't want to risk losing them. Not quite as spectacular in flower is Abutilon 'Milleri Variegatum', but it more than makes up for it with fantastic variegated leaves. The flowers on all three varieties are not large, but are a very graceful bell shape. 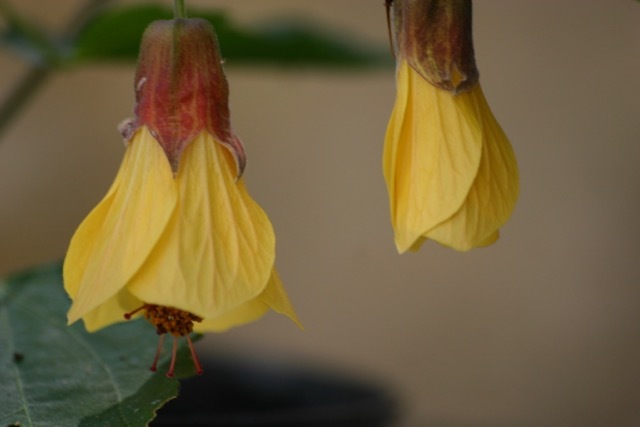 Below is Abutilon 'Kentish Belle'. 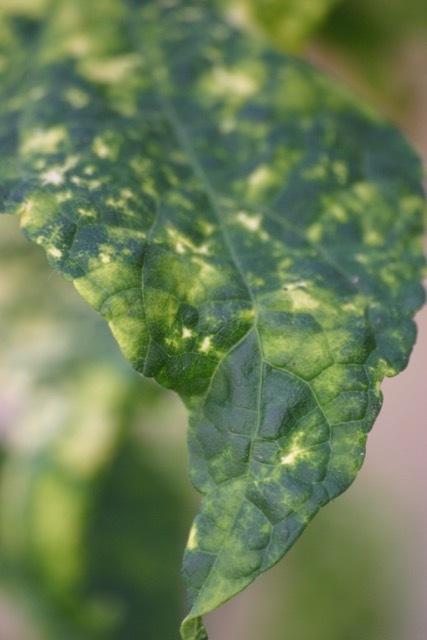 The variegated form is the most tender, but the others can stand a few degrees of frost, and will survive mild winters in a sheltered spot, so I am reliably informed by the nursery owner I bought them from ('T3 Wall End Nursery'). Above is an un-named variety I bought from a nursery, and it has been covered with glossy, almost waxy flowers continually. It is a lovely plant, which I am also hoping to propagate. 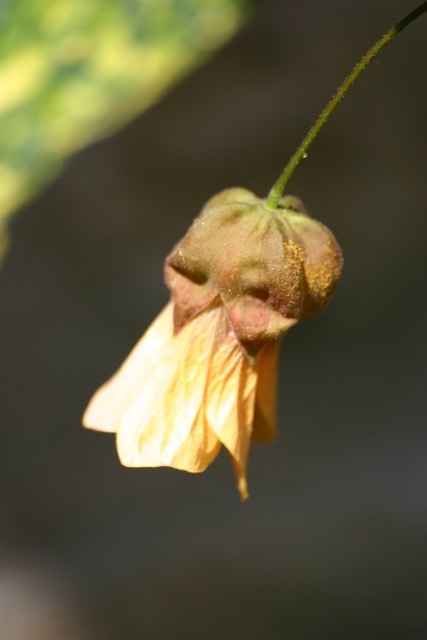 Abutilon 'Megapotamicum' looks like little hot air balloons, and it flowers very freely. The shrub is in the greenhouse and is clearly enjoying the temperatures in there. 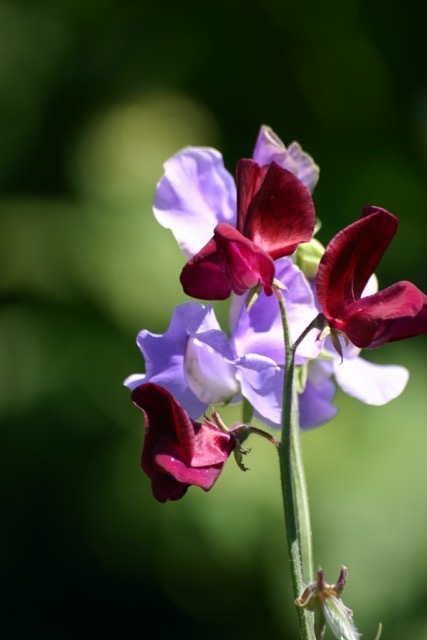 Last summer we went to Easton Walled Garden, which specialises in sweet peas, and gives the opportunity to see many different varieties growing, and also to purchase the seed. 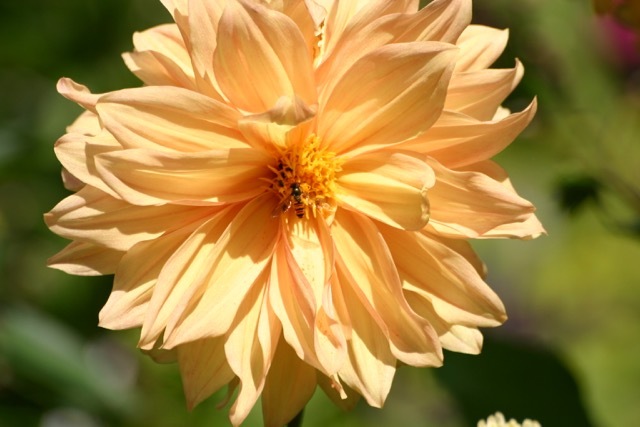 We chose six varieties, and all are doing well, and the flowers are spectacular. The varieties pictured below are 'Our Harry' (lilac), and 'Black Knight' (deep maroon) . 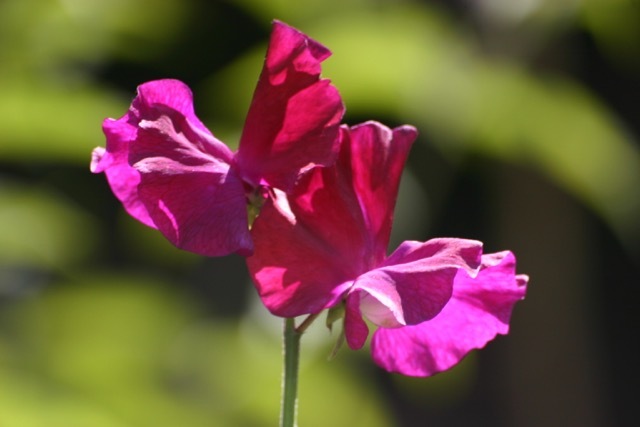 The pink sweet pea below came from seed which I seem to remember, came free with a garden magazine. 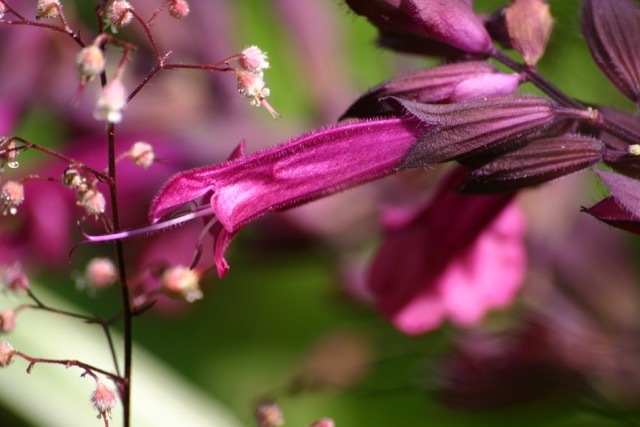 Now, we come to the biggest star in the garden this season, Salvia 'Love and wishes', dark and luscious, with fairly loose, lax growth. 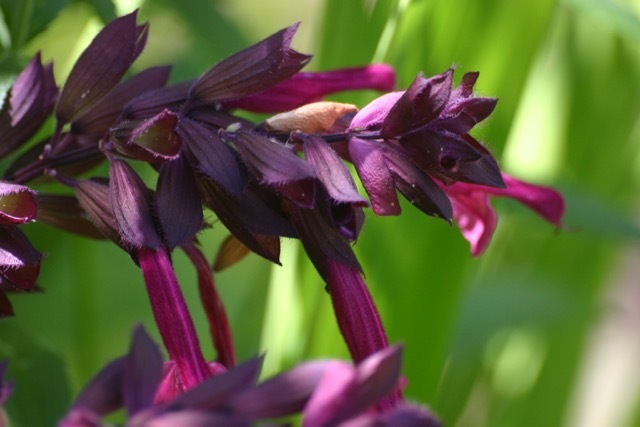 It's pink and plum colouration make it a good foil for many garden plants, and works well in the border with Acer Palmatum, a dark foliaged Dahlia 'Bishop's Children', and a dark heuchera. Salvia 'Love and wishes' is in the centre of the photo above. It prefers a sunny position and will grow to about 32 inches in height. It has a long flowering season, if dead headed regularly, and it is hardy to about minus five, so needs protection in very cold weather. 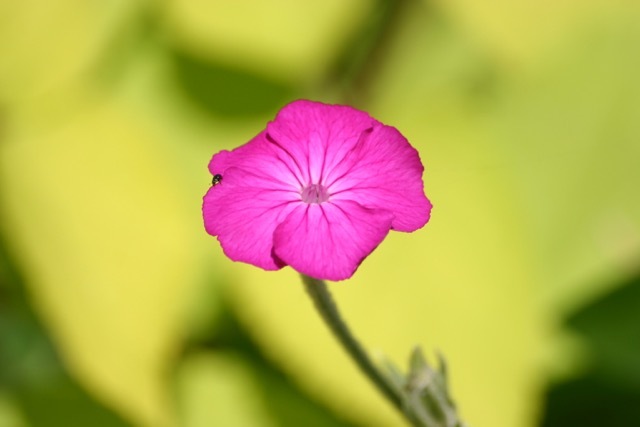 I grew Lychnis (pink and white) from seed a couple of years ago, and it is really fantastic this year. 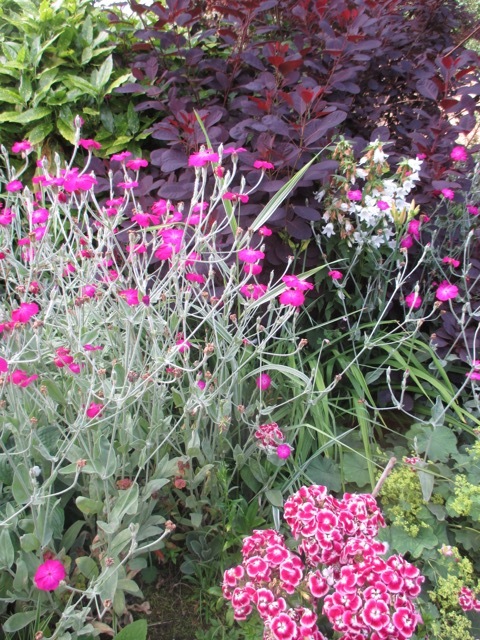 The hot pink flowers and silver grey foliage contrast well with the dark red of Cotinus Coggyggria and the pink of the Sweet Williams (also grown from seed). So, perhaps it is too early in the season to be evaluating individual performances, but I think I already know the winners and the losers!